or in hundreds of cities worldwide. Our national toll free telephone number, 800.327.5434, is answered by a courteous professional 24 hours a day, 365 days a year. and completing a simple online form. Our GDS system allows travel managers and travel agents to book our service when they use GT3, Saturn, Sabre, Apollo or Worldspan to reserve their air and hotel. 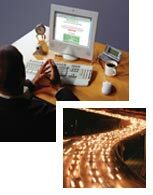 We develop dedicated web portals for corporations, allowing them to seamlessly book their ground transportation requests directly into our Reservation Database from any computer with Internet access.